A recent job of mine. 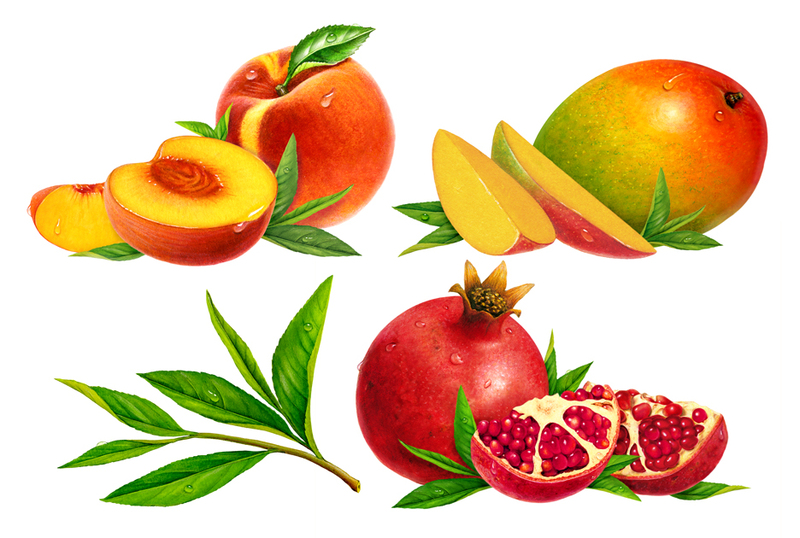 The illustrations are to be used on the labels of four different flavors of iced tea. Pictures can convey so much – updating my blog is always a joy for me. It isn’t easy for me to tear myself away from working on my audio book and songs. Lately, I have had a steady stream of illustration jobs that continue to surprise me. Juggling music, writing and art allows me to take full advantage of my Mac computer! My wonderful life is made possible by knowing my parents are stable and getting good care. I stay on top of things at their nursing home as much as possible. 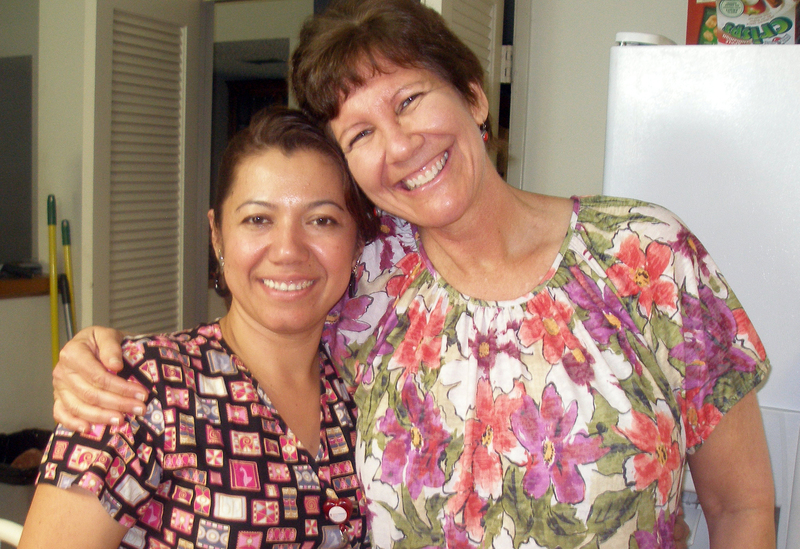 At a recent care meeting for my mother, tears filled my eyes when a nurse recounted the conversations she once had with my mother. We both were incredulous at how much my mother has changed because she is unable to converse much anymore. When my mother became seriously ill and both my parents moved in with me, I know I was in shock. I remember sending out updates by email constantly to many people, and I hardly write updates like I did before. Now I am filled with acceptance as I watch them steadily decline. I will share a recent email update at the end of this post. 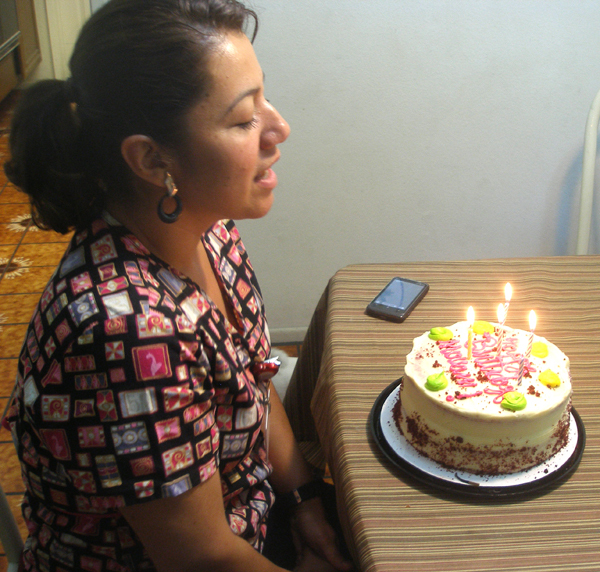 Two weeks ago, it was Miriam’s birthday and we celebrated with a cake at one of our weekly lunches. Miriam is such a wonderful companion to my mother. I adore her, and I know it’s apparent from the photos. My father continues to be quite morose. He moans loudly and continuously because he is in tremendous discomfort due to his catheter. He dislikes painkillers, and occasionally takes Tylenol. Recently, his nurses began to give him Vicodin instead. Everyone around him always complains about his moaning, and probably couldn’t stand it any longer. Sadly, he stills moans and his glazed eyes do not look any less pained. 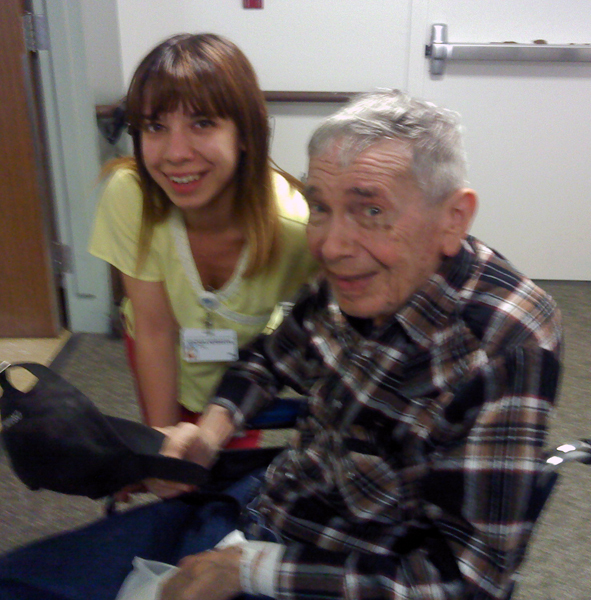 My father cries easily, and I often see him crying whenever he has a favorite caregiver as I drop him off. I am always touched to hear how he describes the special people in his life. The woman he cried over last week was named Veronica. She was tiny – only 4 feet, 11 inches tall. But my father told me that she was strong enough, and she certainly made a difference to him. 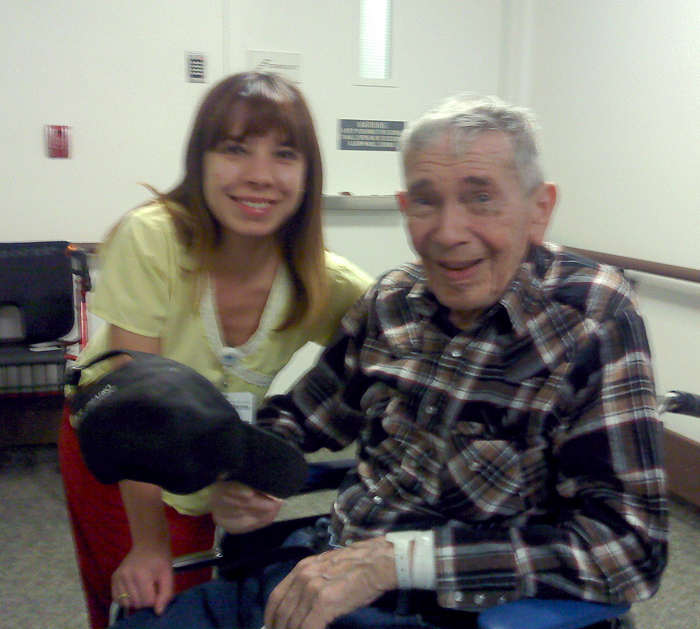 Before I left his nursing home, I thanked her and let her know how much she meant to my father. Our conversation turned to music and before long, both of us were sharing how much we loved to sing. I said to her, “Even if it’s been many years since you’ve sung, Veronica, it’s never too late to sing again.” I sure hoped she would remember my words. I continue to utilize every aspect of hypnotherapy to control my thoughts and stay positive. Picturing myself as “blessed,” is a beautiful concept that allows me to continue smiling even though I sometimes struggle. My dedication to my personal project (another description of my audio book) has not given me much exercise or fresh air. The weather became warm last week, and I made a commitment to take my mother on a special outing. My daughter and my mother’s companion, Miriam, joined me. It was Miriam’s idea – a month ago she told me that a year earlier my mother had mentioned that she longed to see the beach again. On the day that I planned to take my mother out, it was gray and drizzling. Though I debated about cancelling, I decided to follow through. 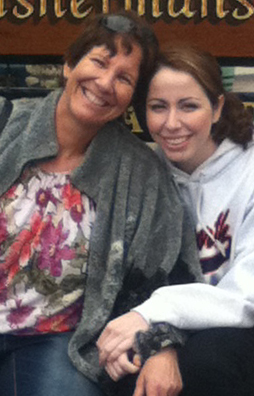 This is rare – my daughter allowed me to share a picture of us together. 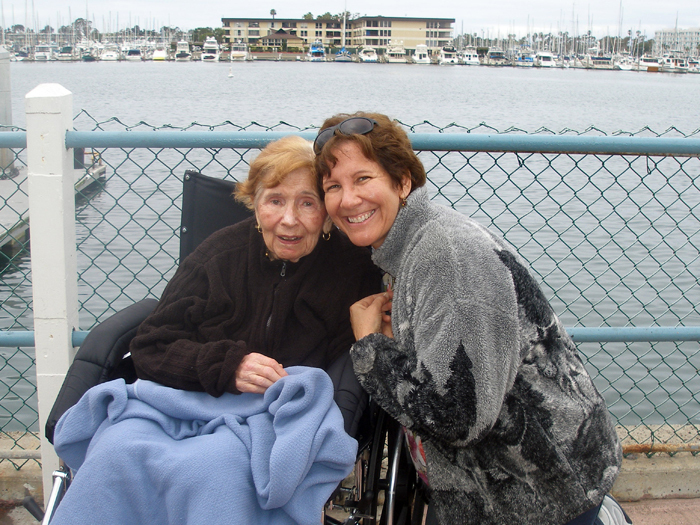 I ended up going to Marina Del Rey instead of Santa Monica, because I thought it would be easier to push my mother’s wheelchair. 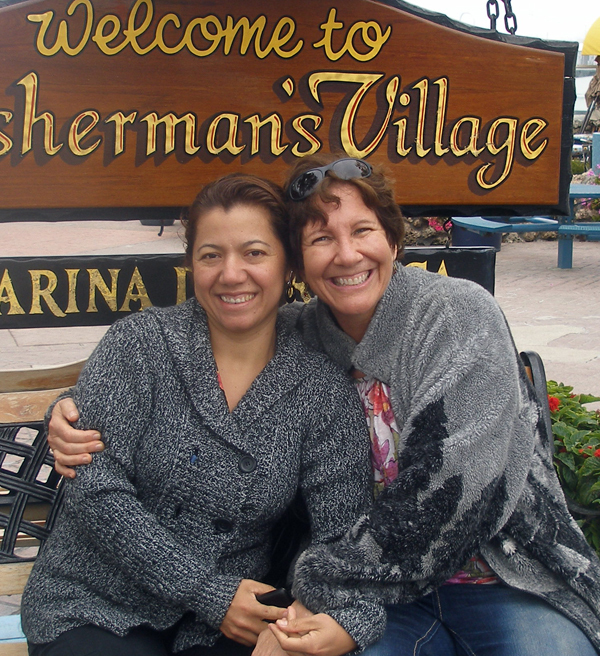 We walked around fisherman’s village and then ate at one of my favorite restaurants for lunch. We all sat outside overlooking the ocean and enjoyed steaming hot coffee while waiting for our food. I could write pages and pages of my memories from beach outings with my mother. Throughout the day, I felt so much nostalgia remembering those times in my life. 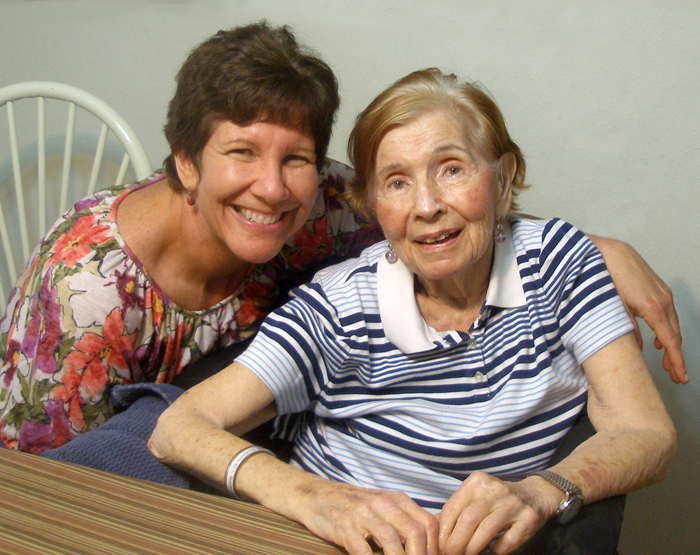 Despite her advanced dementia, my mother appreciated the outing more than I anticipated. She was relaxed and sang blessings in Hebrew as we walked near the marina. As I drove home, my mom slid down in her seat, and the seatbelt was barely holding her in. We arrived back at her nursing home. Just before taking her out of my car, I reached over to kiss her. Those were the clearest words she had spoken all day, and were exactly what I needed to hear. The beams of light that shone from my body could have illuminated a city at that moment. I realize I haven’t written an update about my parents for a while. In many ways, that is a good thing. There has not been a “crisis” or anything requiring hospitalization! Both my mother and my father are struggling courageously with old age. They are not really together, but are joined by the fact that their circumstances have left them helpless and dependent one floor away from each other at their nursing home. My mother is not in terrible pain; but her dementia has advanced to where she cannot maintain an intelligible conversation most of the time. There are no more phone calls where she can respond to my voice. She keeps having recurring bronchial infections, her coughing spasms exhaust her and she sleeps most of the time. My father’s face is ashen and he moans continuously from what he labels “discomfort.” His catheter cannot be removed and he also suffers from recurring urinary tract infections. Most recently, his infection was a result of E Coli and is now being treated by IV antibiotics because it was resistant to his last round of oral antibiotics. Although he tells me he wishes he were dead, he still looks forward to our time together. Thankfully, Miriam is quite devoted to helping me with both my parents. My father looks forward to visiting with me one afternoon every week, and my mother comes to lunch at my house every week. On the weekend, I take both of them out to lunch. I am managing and have accepted that things are the way they are – there is no cure for old age. I remember how vital and active both my parents were for many years. They were always there for me and now I am there for them. I am thankful I have had them with me for so many years. I realize I am not sharing like I had before. In the beginning of their decline, I believe I was in terrible shock. Now the process has become one of slow acceptance, with great sadness. But that has been alleviated so much by the discovery of my ability to create music and write. God has been good to me. This entry was posted in Uncategorized and tagged "sandwich generation", acoustic guitar, Aging Parents, Art and Illustration, Caregiving, catheter, composing, creativity, dementia, Friendship, loss, lovesong, lyric development, lyric writing, lyrics, mother daughter relationship, mother's illness, Music, performing, singing, songwriting. Bookmark the permalink.